The crystal-clear, turquoise water of the lake that reflects the impressive Karawanken Mountains adds a touch of the Caribbean to Carinthia. Lake Faak reaches temperatures of up to 27 ° Celsius in the summer, thus attracting even those who wouldn’t sually swim in mountain lakes. With some 300 days of sunshine a year there are innumerable opportunities to go sailing or surfing. The ‘Kajak-Center Faaker See‘ offers even more variety in terms of water sports, such as rafting and canoe tours, as well as stand-up paddling lessons. The mild climate and the varied terrain for walking, hiking and climbing make Carinthia a top destination for outdoor enthusiasts. In addition, the Province is home to several golf courses set amid the stunning Carinthian countryside. Every year in September the snug town of Faak am See attracts thousands of Harley enthusiasts for the annual Bike Week. Those who are rather into fashion, art and crafts will enjoy shopping in nearby Villach. In terms of sports and recreation the charming town of Faak am See has a lot to offer in winter, too. The Gerlitzen and Dreiländereck ski areas are within easy reach: While Gerlitzen comes with wide and well-groomed slopes and a permanent race track, Dreiländereck offers slopes on Austrian, Italian and Slovenian terrain. Gerlitzen is accessible within a 15-minute drive and highly recommended for families. Dreiländereck in the Karawanken Mountains is about 30 minutes away. In addition to 17 kilometers of slopes for Alpine skiing, Dreiländereck boasts perfect conditions for ski mountaineering, winter walking and cross-country skiing. With 10 kilometers of tracks the Seltschach-Loipe is especially suitable for beginners. Sledding enthusiasts of all ages love the eight-kilometer natural track meandering through the forest. The Dobratsch Nature Park stands for a more quiet winter, snow and nature experience off the crowds, with immaculate ski runs but no ski lifts at all. The turquoise water and the bizarre mountainscape create a truly romantic atmosphere! The crystal-clear lake boasts grade A water and reaches temperatures of up to 27 °C in the summer, thus making it a popular destination for water sports enthusiasts. 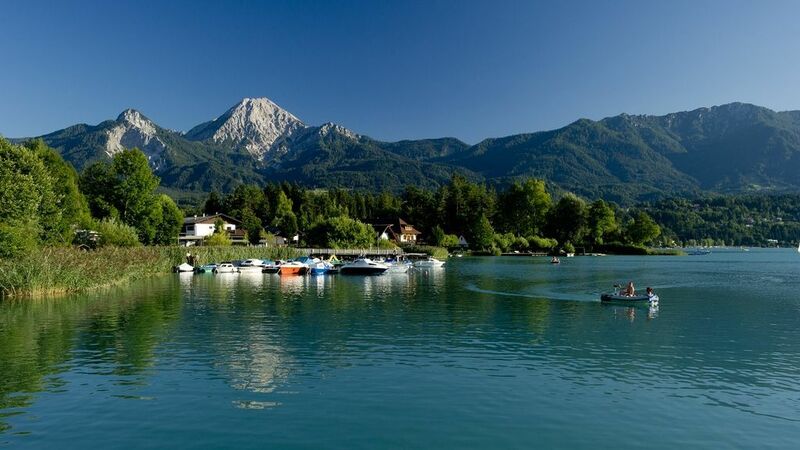 No matter if you go for the mountains or prefer to stay down in the valley, if you come for relaxation or rather for action and sports: The Faaker See area has a lot of activities to offer for nature and outdoor enthusiasts of all ages and ambitions, including walking and golf. Gerlitzen, for instance, is famous for its wide and perfectly groomed slopes and the permanent race track, while Dreiländereck offers skiing in three countries (as its name suggests): Austria, Italy and Slovenia. Explore Carinthia's unspoiled mountain scenery far from the bustling ski resorts: Dobratsch Mountain offers an unparalleled ski mountaineering experience! In addition, several spa centers are within easy reach. Enjoy your family break! Welcome to the sunny south of Austria! Nowhere else in Austria does the sun shine as long as in the Faaker See area: 2,010 hours a year! Located at the hub of some major traffic routes, only a few kilometers from the Italian and Slovenian borders, the Faaker See region offers sunshine and an easy-going lifestyle, but also outstanding skiing thanks to cutting-edge snow-making machinery. Italy, Belgium and the Netherlands (motorail train). From late March onward there will be three daily Lufthansa flights to/from Munich:Munich's Terminal 2 is the fastest and most modern terminal in Europe.